U.S. Attorney General Jeff Sessions delivers remarks during the Sergeants Benevolent Association of New York City event on May 12, 2017 in Washington, D.C. Sessions has been the subject of scrutiny over his failure to disclose meetings with Russian ambassador to the U.S. Sergey Kislyak during the 2016 campaign, which Sessions has defended as routine — part of his duties as a U.S. senator. In his opening statement to the Senate Intelligence Committee, released on Wednesday, Comey detailed a private conversation with President Trump in the Oval Office shortly after National Security Advisor Michael Flynn was forced to resign, in which Comey recalls the president saying, "I hope you can see your way clear to letting this go, to letting Flynn go. He is a good guy. I hope you can let this go." This has raised questions as to why Comey didn't tell others, including the attorney general. Comey said in his opening statement that his leadership team at the FBI agreed not to share this with Sessions for the following reason: "We concluded it made little sense to report it to Attorney General Sessions, who we expected would likely recuse himself from involvement in Russia-related investigations." Comey also pointed out that they were right – Sessions recused himself from the Russia investigation less than two weeks later. The question is why Sessions recused himself. Democrats on the Senate Intelligence Committee took advantage of Comey's mention of this in his opening statement to raise such questions about Sessions' recusal on Thursday. "What was it about the attorney general's interactions with the Russians or his behavior with regard to the investigation that would have led the entire leadership of the FBI to make this decision?" asked Sen. Ron Wyden, D-Ore.
Comey responded, "He was very close to and inevitably going to recuse himself for a variety of reasons. We also were aware of facts that I can't discuss in an open setting that would make his continued engagement in a Russia-related investigation problematic." The prospect of facts that would be problematic for Sessions seems to vary for the reason Sessions himself gave when he recused himself from the Russia probe on March 2. "I should not be involved in investigating a campaign I had a role in," Sessions said. His rationale was that his role as a high-profile surrogate and advisor for the Trump campaign made it inappropriate for him to be involved in an investigation of that same campaign, a rationale which received little pushback, except reportedly from the president himself. In fact, Sessions' recusal came after he said in his confirmation hearing that he "did not have communications with the Russians." Sessions had met with Kislyak twice during 2016, though Sessions said his misstatement was a result of the fact that he met with Kislyak in his role as a senator involved in foreign policy. "I never had meetings with Russian operatives or Russian intermediaries about the Trump campaign," Sessions said in March. 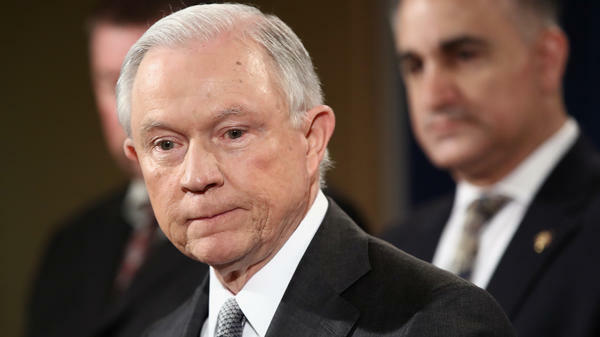 The Department of Justice put out a statement Thursday evening, asserting that Sessions' "participation in President Trump's campaign" was the sole reason for his recusal. "Shortly after being sworn in, Attorney General Sessions began consulting with career Department of Justice ethics officials to determine whether he should recuse himself from any existing or future investigations of any matters related in any way to the campaigns for President of the United States," the statement said. Democrats pounced on Thursday after hearing Comey's suggestive language about "facts that I can't discuss in an open setting." "The hearing raised serious questions about Attorney General Sessions that he and the Justice Department must answer immediately," Senate Minority Leader Chuck Schumer said in a floor speech shortly after the hearing with Comey ended. "The Senate Intelligence Committee investigation and special counsel Mueller ought to get to the bottom of this matter." The White House stood behind Sessions. Deputy White House press secretary Sarah Huckabee Sanders was asked if Trump has confidence in his attorney general, a question press secretary Sean Spicer would not answer earlier in the week. "Absolutely, the president has confidence in all of his cabinet and if he didn't, they wouldn't be here," Sanders said on Thursday. Sessions will soon face questions from senators. He is scheduled to testify on Tuesday in a committee hearing about the 2018 budget for the Department of Justice — but it's a pretty sure bet that Russia will come up.